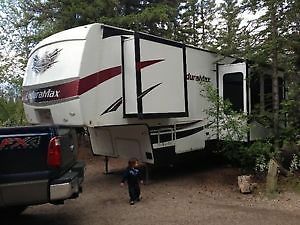 2011 Gulfstream Enduramax 3310END Toy Hauler. Its a great trailer with all the trimmings. It has a sound system, fuel station, built in generator, 2 slides, alarm system, convection oven, electric awning, etc etc. This trailer has not been used very often, we only went out one time last year and twice the year before and not many times before that even, that is the reason we are selling it we just do not use it much so someone else can enjoy it better. If you have any questions or want further information please message me @ 780-740-3455. 2014 Open Range Lights 269BHS Fifthwheel. Only used for 2 weeks. Still smells new. Never smoked in or had pets. Lots of storage. One queen bed, 2 single bunk beds, and couch folds out into a bed. Built in generator with switch inside to turn on can barley hear it run heater and a/c works amazing. Has solar panels to charge battery's so they never go dead satilite. Basically all the bell and whistles. Has 3 propane tanks all the hooks up for electrical from 220 tonimarl plug in, also has 2 slides so lots of space always been winterized never had leaks or used in the winter. Selling cause I want a smaller one. It is a fifth wheel can hook up on a 90 degree angle and half ton towable. Am absolute beautiful unit. If need more pictures just ask it had always been stored in heated shop. Please call 403-392-3593 to view. 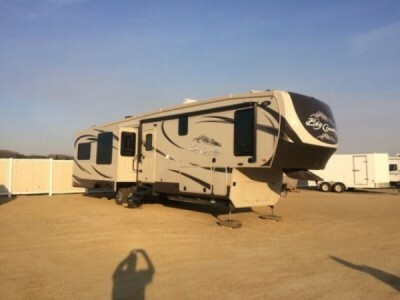 2011 Keystone Montana Mountaineer 345DBQ Fifthwheel. Meticulously Maintained Upgraded 2011 Montana. Mountianeer 5th Wheel. Like new condition. 50Amp service. 2 Bathrooms. 4 slide outs. All slides have awnings. Fabric protection. 2 deep cycle 6v batteries. Solar panel. 2300 watt inverter. Max turn front nose cap. Back bedroom with 4 single beds. Booth style dinette. Preped for a washer and dryer. 15000 BTU air conditioner. Remote Control, that controls, Awning, Slides, Front and rear jacks, and security lights. Should be towed with a 1 Ton truck. Selling because we want to down size. Please 403-606-3606 to view. 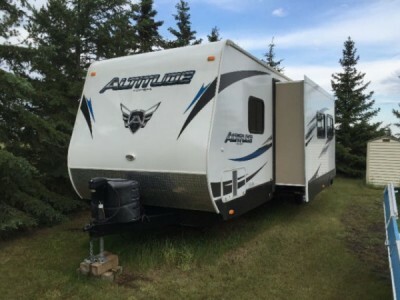 2015 Keystone Laredo TG320 Trailer. 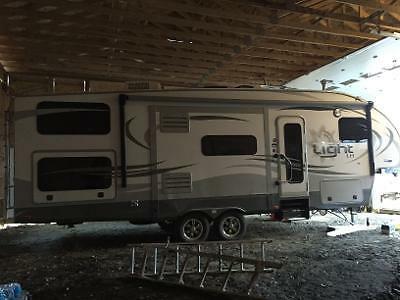 Power awning, LED lights on awning, power jacks, 4 max air vents, rear ladder, outdoor kitchen that includes bar fridge, stove, cupboards, sink, and outdoor Coleman BBQ, 3 slides, island kitchen, 42" T.V., amazing bunk room- couch, super single bunk and single bunk- great for kids or grandkids to have their own space, exterior shower, 2 doors a must see! Please call 780-719-1287 to view. 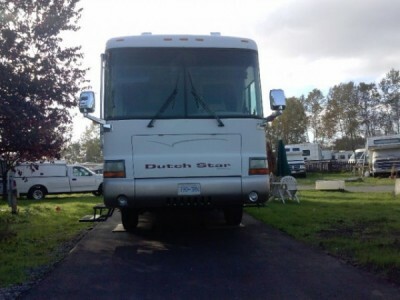 2013 Pacific Coachworks Powerlite 325FSX Toy Hauler. 2 Slides, Sleeps 8. Never Smoked In. Dual Axle. 12 foot Garage. Includes built in generator, fuel storage, Heavy Duty Stabilizer Jacks, Electric Jacks, Power Awning, Gross Weight 16,500 pounds/ Dry Weight - 12,580 pounds, Electric Double Bunks - Bunk Converts to Couch and Table -( Pic included), 3 built in TVs, DVD/CD player, Built in Radio, Outdoor Speakers. No PayPal or Trades Accepted. Please call 780-864-9432 to view. 2015 Cruiser Radiance 28BHSS Trailer. Brand new only used one season added solar panels has two 6 volt batteries, two 30lb propane tanks, second door for bathroom bluetooth speakers and outside speakers. The bunk beds are motorized and can move out of way for extra room or storage. Has spray rock panel in front and extended warrenty. We also put max air vents. Solar panals keep the battery full almost all the time when when playing music all day. My son is colic and I thought he would have grown out of it by now and its just not fun I honestly do not want anything we put into it just whats left owing. You can even have the septic pods, rv toilet paper, plates cups cutlery outside mat pots pans even kids toys if interested. I am just done fighting about this and want it gone please!!! Specifications: Sleeps-9, Slides-1, Length- 31ft 9in, Weight-585 lbs, Dry Weight-5360 lbs, Cargo Weight-2225 lbs. $38,000 left on loan about 125 bi weekly. Please call 403-585-2385 to view. 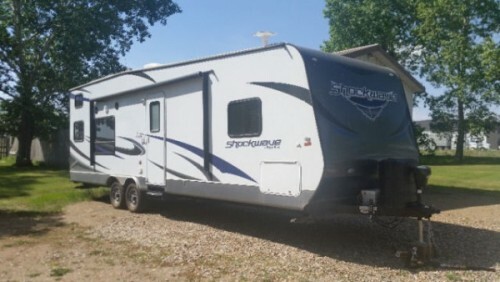 2014 Jayco Eagle 308RETS Trailer. Many extras, Winegard Satellite system, Solar panel, full skirting fireplace and much more, mint shape. Please call 780-296-6498 to view. 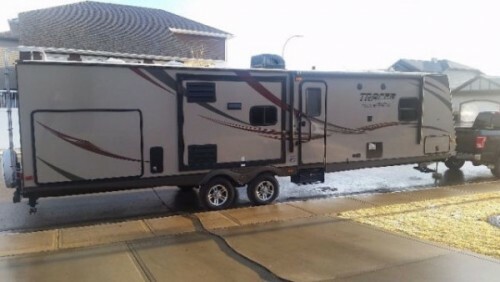 2015 Prime Time Tracer 3200BT Trailer. 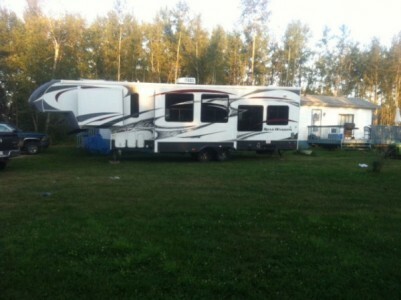 Immaculate 32 Foot Light Weight Bunkhouse Travel Trailer with loads of upgrades. 3 Slides, Sleeps 9, Roomy kitchen with lots of storage, pantry and pots and pans drawers, Large Island with counter space, Roomy washroom with glass door stand-up corner shower, Comfortable, residential style pull-out couch with mattress, Aluminum Rims, Deluxe outdoor stone look kitchen with large fridge, cupboards and sink, Rear bunk room with pullout coach into Queen size bed, Power Awning, Power Jack, High Gloss Fiberglass Exterior, Bus style slam latch baggage doors, Magnetic door catches, Easy 1 location total hook-up, Outside entertainment speakers and TV hookup, LED flat screen TV, Heated Underbelly, Extended Warranty until 2021. Please call 780-932-5294 to view. 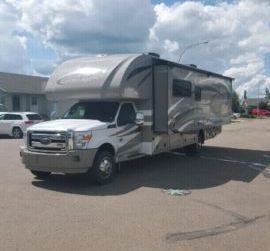 2013 Thor Four Winds 33SW Class-C Motorhome. Sleep 8. 6.7L ford diesel. Rated to pull 10000 lbs. 4 batteries. 4 years left on extended warranty. Lightly used. Please call 780-581-5507 to view. 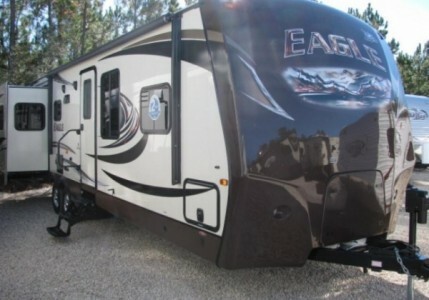 2013 Jayco Eagle 275BHS Fifthwheel. 1 Slide & all accessories included - comes fully equipped with almost everything you can think of including a Honda Generator- ready to go camping. Tonnes of storage. Will also include the 5th wheel hitch. Please call Jason at 780-220-8000 to view. 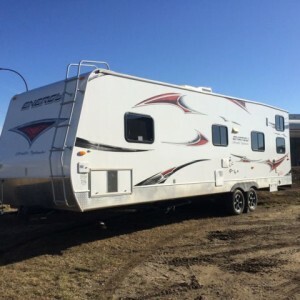 2013 Keystone Energy 245FBWE Toy Hauler. 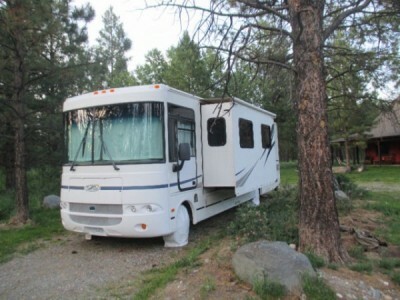 Ultra light key stone toy hauler for sale, fully loaded. Sleeps 7 with 3 queen size beds. Fits two full size quads. Has built in generator, fuel station, indoor and out door shower, TV, DVDs, inside and out side stereo. Lots of extra and has been well taken care of. Sask registered. Please call 780-808-4184 to view. 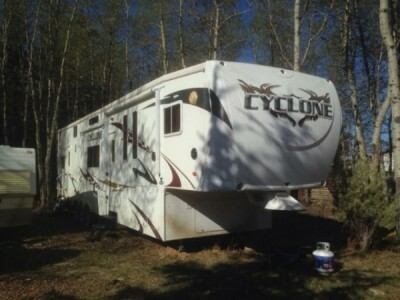 2009 Heartland Cyclone 3950 Toy Hauler. 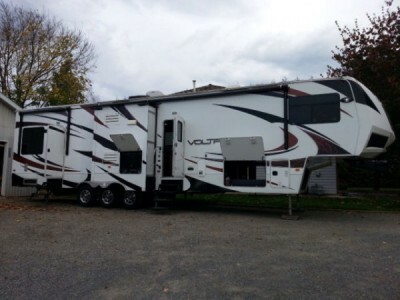 This amazing unit has everything you need to live comfortably in the many areas around GP with full hook ups. You can even have a roommate since it has a separate living space in the garage with it is own 1/2 bath. It also has a second fridge, a washer/dryer combo unit and a small security "system" that allows you to see who is at your trailer before opening the door. It is almost exactly like the you tube video below except ours has no second awning over the rear door, ice maker or coffee pot/toaster combo LOL (The color scheme is a bit different I think but we have ours all slid in or I could have made the exact same video! Ours DOES have dual bunks in the garage that store on the roof so you can still transport toys or keep things in the garage. AND an on board fuel station among other extras. Please call 780-876-0549 to view. 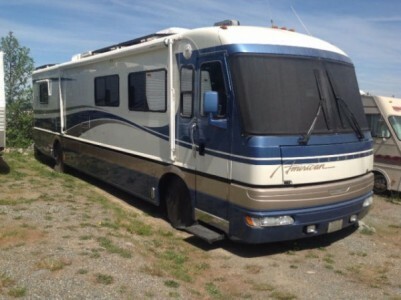 1999 Fleetwood American Tradition 40Ft Class-A Motorhome. This is a 1999 model and they built them better than the newer models. It is like a new model with all the $20,000 in upgrades we have done to make it safe and reliable for our use. Beautiful inside and out.Has to be seen to be appreciated. 3 tilt solar panels c/w Blue Sky solar boost tracking, for any dry camping you want to do. New electrical board installed in 2011 for the 2 door fridge with icemaker. New sub floor and top of the line flooring, 2 new furnaces, new sink plumbing and faucet for kitchen sink, new controls for automatic jacks replaced spring 2014. C/W washer/ dryer, convection Microwave, power steps, new 32" flat screen TV in front and smaller TV in bedroom, separate full size shower and sink, toilet in separate room.7500W diesel Onan generator (28.5 hrs). White leather captains chairs and sofa/bed, office desk with all the hookups for your printer, PC,etc. 2 satellite dishes with receiver for Canada, Mexico and USA. New radio/CD/DVD player window fans to keep the winshield clear, good 275/80R/22.5 Michelin tires. Beautiful air ride comfort. Raring to go south this winter or there's next summer. We also have a 2007 Hyundai Santa Fe with 97,500 km, with hitc for a Blue Ox hitch. Negotiable. Both in excellent condition and a must see. Lots of storage doors on the MH (both sides). Heated basement model with two sliding drawers. Too many features to list. A must see. One 13 ft slide with a new canopy installed 2013,New springs put in the 20ft awning Sept/15, new roof installed Oct/2015. All tires have sun protected covers, plus the windows have covers or awnings. 4-6 volt house batteries, 2 - 12 volt engine batteries,were replaced Nov10, 2015. Allison Transmission/Spartan Chassis, 24 valve-5.9 engine. Also a new starter in 2012. A new hot water tank installed 15/10/2014 and a new converter/inverter installed on Nov 13/2014. A new relay switch to the Onan generator Aug/2015. New roof Nov/2015, New front brake shoes and tail pipe May 14/2016 Nothing left for you to update. This is a very nice unit. We had plans to do lots of travelling.....illness got in the way. For a more detailed list of options, pictures, etc please call 250-245-3072 or email. 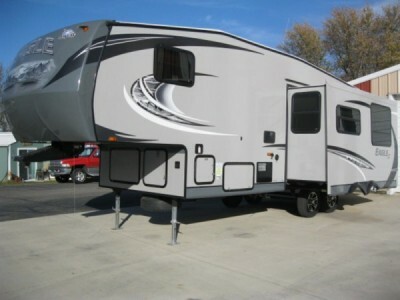 2013 Keystone Laredo 335TG Fifthwheel. 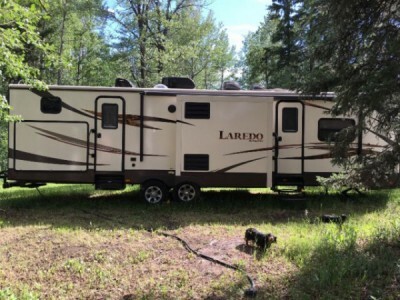 38 feet, 3 slides, outside kitchen,power awning,queen size bed in front,separate bedroom in rear with bunks & couch, A/C, built in vac, microwave, 3pc bath with shower, outside shower, barbecue. Weighs about 6000kgs. Still has warranty till sept 2018. In like new condition. Used very little. Please call 403-866-5269 to view. Black Tank Flush (Optional on MX Series), Built-In Generator (DX Series), Deep Single Bowl Sink w/ Two Covers, Drive Up Wheel Well, E-Z Lube Axles & Self-Adjusting Brakes, Electric Bed w/ Sofa (T23FS, T25FQ, T27FQ, T27FS, T27SA), Exterior Marine Grade Speakers, Family Message Center w/ Electronic Charging Stations (Bedroom and Living Room), Four Corner Stabilizer Jacks, Full-Extension Metal Drawer Guides, Fully Insulated 2-in Floor w/ 5/8-in Tongue & Groove Marine Decking, Generator Prep (MX Series), Matching Spare Tire w/ Carrier, Microwave w/ Carousel, Oversized Kitchen Window, Power Awning (DX Series), Single Electric Bed (Standard on T24FQ ONLY; Optional on T21FQ ONLY). Please call 403-382-7231 to view. 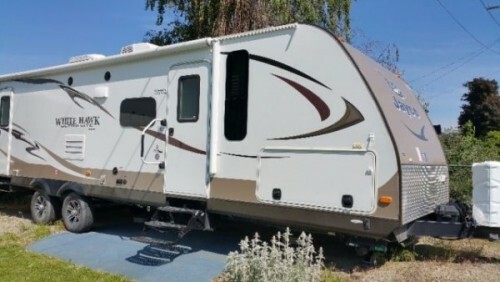 2005 R Vision Trail Lite M321 Class-A Motorhome, Very good condition, GM Workhorse Chassis, Allison transmission, 2 slides w new toppers, Onan 5500K Generator 180 hrs, 100 W solar panel with 2000 watt inverter/charger, hydraulic leveling sytem, solid maple flooring upgrade in kitchen and bathroom, drivers door with power window, King dome satelite system, AM/FM CD player, upgraded flat panel TV with DVD, newer tires all round, 5000 lb hitch W electric brake system, 2 AC units, cruise control, queen bed W pillow topper and queen sofa W pillow topper, 4 coach batteries, spare tire with carrier, electric heated mirrors, microwave convection oven combo, regular oven and full unit cover with wheel covers. Please call 250-423-8843 to view. 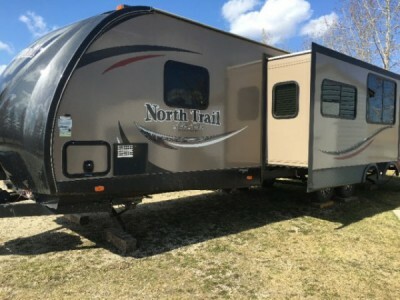 2013 Heartland Northtrail 33TBUD trailer. This trailer is in mint condition. Only used twice in peoples yards, has never been taken to a lake or campground. Sleeps 10, 42-in TV is still covered in the original plastic. Comes with an outdoor BBQ that has never been opened. Extras include an outdoor bar with mini fridge, outdoor speakers, outdoor shower, power jacks and awning, master bedroom with a queen size bed, bunk beds in the rear bedroom with a table and bench seats in that room as well as a full size table in the kitchen. Kitchen island, hide-a-bed couch, 3 slides, lots of storage inside and out. Payments can also be taken over for approx $380 a month. Located in Peace River. Please call 780-618-1585 to view. 2014 Jayco Whitehawk Summit Series Trailer. 33 ft-Dbl over Dbl Bunks in front-Separate Queen Bed in back in separate bdrm-pull out dbl bed in living area-superslide in bdrm and main area-solar panel-indoor and outdoor kitchens-tub with shower-lrg fridge-TV, Bluray Player, Stereo-Elec Stabilitzer Jacks-give us an offer to include sheets/towels/dishes to move right in! Please call 250-212-5748 to view. 2015 Crossroads Altitude 310 Toy Hauler Trailer. 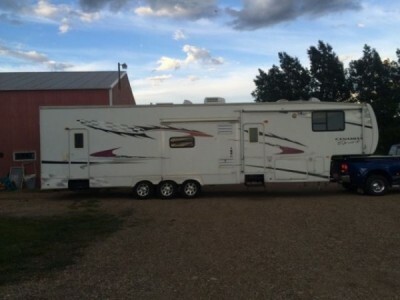 This has been a great trailer but owner family has become too big and we are in need of an upgrade. We got it last year in the spring and we have had it out only seven times. the trailer is in impeccable shape just like the day we bought it. the trailer is fully loaded, options are. 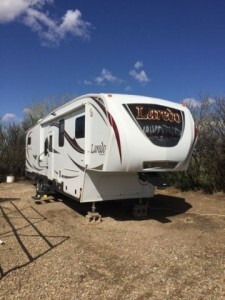 Bluetooth stereo with built in dvd,indoor and outdoor speakers, 47" flatscreen tv, tv hookups in bedroom and garage, AC,leather couches (hidabed),113L fuel station, 10' garage with power dropdown bunk, power awning with built in LED lights, plumbed for onan generator, two 20lbs propane tanks, power jacks all around, 15000lbs hitch with equalizer bars and sway control bars, outdoor shower, black tank flush, bathroom skylight, tones of storage! and dont forget six year full extended warranty with interior and exterior protection security etching and tire and rim warranty. Please call 780-974-7843 to view. 2012 Dutchman Voltage 3795 Toy Hauler Fifthwheel. 42ft-9in long with a 12ft garage. Triple axle with 3 slides. Built in generator, Shawdirect satellite TV, 30 gallon fuel station, a/c, rear bunks and tonnes of storage space. Immaculate condition, very high end. Please call 604-835-9846 to view. 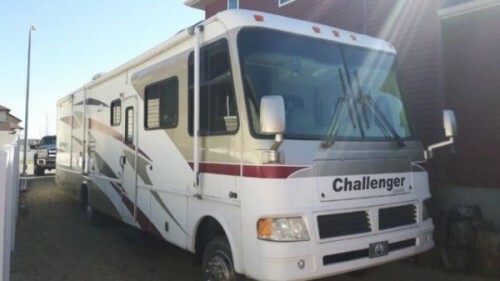 2006 Damon Challenger 36Ft Class-A Motorhome. Sleeps 8. Two couches. On board generator. 8.1 L Chevy motor with Banks exhaust. Lots of storage. One touch self leveling Jacks. Two slides, bedroom and couch / dinette. Leather captain chairs. Two a/c units. Please call 403-588-9805 to view. 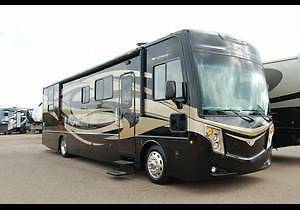 2014 Fleetwood Excursion 35B Class-A Motorhome. 300HP Cummins® ISB 6.7L w/Exhaust Brake. 2100MH Allison Transmission. 22.5" Aluminum Wheels. Automatic 4-Point Hydraulic Leveling System. Side View & Rear View Camera. Pioneer In-Dash DVD Player with Bluetooth Phone Connection. 90-Gallon Fuel Tank. Pass-Through Storage. 84in Interior Height, Sony 40in HDTV with DVD Player & SoundBar, Sony LED TV in Bedroom, Vinyl Tile Flooring Throughout, Hardwood Cabinetry, Reversible Designer Comforter, Residential Refrigerator, Couch Turns into a Bed and Longer Sectional, Solar Panel (Added Ordered Option), Hide-A-Loft Overhead Bed (Added Ordered Option), Exclusive Dream Easy Mattress. Very Clean Like New. Recent Service done. (May 12,2016). Please call 604-839-6497 to view. 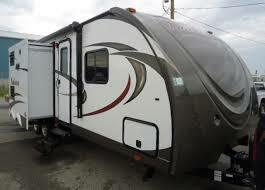 2010 Forest River Cedar Creek 36RE Touring Edition Fifthwheel. has everything you need for a comfortable stay anywhere you may be. Start with the fantastic paint package, colours go good with any coloured vehicle you choose to pull it with. The large seamless tinted glass enhances its stream lined look. The trailer has built in generator area for optional generator. There is also through storage mid way of trailer which makes it easy accessible from either side of the unit. Inside has a full wrap around Corian counter top with double sinks. A full size electric fridge that works perfectly with the factory installed inverter when no power is available. The Fridge, Stove, Oven and Microwave are all finished in a high gloss black finish. this kitchen is any Chefs dream, two roll top pantry's, pull out counter tops for extra counter space, plenty of cabinet space for storage. The dinning room has a table with expansion leaf and four independent chairs. The living area has a electric fireplace for heat or just aesthetics. The 46in LCD TV has pop up remote form the cabinet. This is so when your not watching TV with 6 speaker surround sound it nicely goes down into the cabinet so you can see out the the large picture tinted window in the rear. Again plenty of cabinet space through out. There is a fold out couch with air mattress bed, two recliners that have full lay out positioning. The Bathroom has a large semi round shower. Toilet. Big sink with vanity and mirror. Plenty of cabinet space for all the linens. The Bedroom has a King size mattress. Full closet and 6 drawer dresser. Wall drawer also help with clothing storage. It also has separate closet space for optional Washer Dryer combo. Please call 250-960-9649 to view. 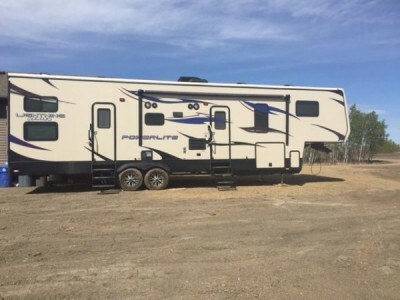 2013 Heartland Big Country 3610RL Fifthwheel. 36ft. 4 slides. Island kitchen with granite countertops double fridge with ice maker. Electric fireplace. Leather couch. 2 easy chairs. 2 TVs and 2 receivers. Self positioning satellite dish. New central Vac. New microwave. Enough storage to smuggle a large Mexican family. AC. Large Stand alone shower. Queen sized bed. Power awning. The unit is in great shape. No emails. Please call 403 789 9188. 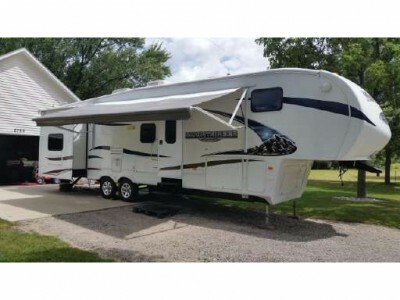 2012 Heartland Road Warrior 30C Toy Hauler. 10ft Garage, 2 slides with Master Suite. 100 gallon fresh water tank, refuelling station and 5000 watt generator. 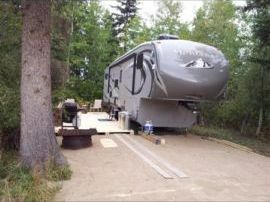 Has power jacks and power awning. 3 queen size beds. Stainless steel appliances! Lots of cupboard space. Non smoking. Motivated seller! Please Text 780-305-4426 or email please! 2014 Keystone Montana High Country 338DB Fifthwheel. High Country Package. Montana Package. Glacier Package. Rear bunkhouse. Outside Kitchen. 32in LCD TV/ 19in Bunkhouse/19in upper bedroom. Living Room Ceiling Fan. Hide-a-bed sofa (2). Front Queen Slider Bedroom. Huge 50x30in tub/shower/glass sliding doors. Comfortably sleeps 8. Glacier Winter package. 2 Air conditioners one with heater for upper bunk. Washer/dryer (paid 2000$ extra installed) used once to try out. 3 tvs. outside kitchen with bbq never used. power jacks and awning. full skirting and wraps for slides (paid 8000$ extra). fifth wheel tripod that locks. electric remote control fireplace heater. leather couches. inside oven never used. stereo remote inside/outside. in floor heating which heats tanks. 38 Ft fifth wheel weighs 9800 lbs dry. 50 amp service. double door fridge with separate double door freezer. separate private toilet room with sink. Double kitchen stainless steel sinks with marble countertop. all manuals and remotes. used 1 summer every second weekend. Please call 403-901-4617 to view. 2011 Monaco Diplomat 43Ft Class-A Motorhome. Like new in excellent condition. 43ft with tag axle, 3 heat pumps and a/c 425 cummins engine, 10000 watt generator with 70 hrs, maintained and serviced regularly, kept undercover, 5-slides 4 Tvs. King size bed in master bedroom Queen size bed converts in the front. New Microwave convection oven Washer/dryer Built-in vacuum system All tile floor Lots of counter space and cabinets plus island in the kitchen. Exterior is Grey with blue/black/grey graphics. Please call 250-808-7778 to view. 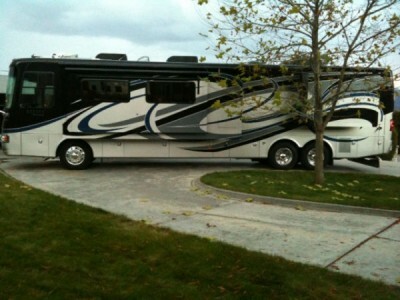 2013 Fleetwood Jamboree Class-C Motorhome. 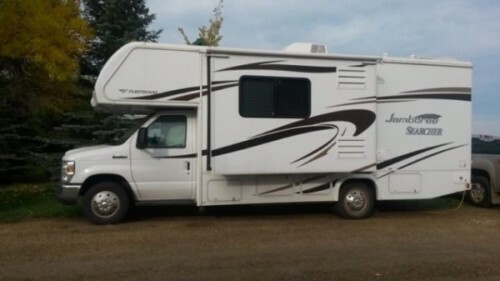 Ford E-450 Super cab Motorhome with backup camera and power awning with 1 large slide Fridge Stove Microwave brand new 32inch television with DVD. Swivel leather recliner chair sleeps 6 or more. Outside shower and stereo and tv hookup has generator, propane, 12 volt batteries plus solar panels so you are never without power. Excellent condition. Please call 780-953-0118 to view. Features. Winegard Auto Tracking Satellite TV. (Dish TV.com). Sony Flat screen tv. tow package. automatic levelers. 14 foot slide with add a room(as in picture). Onan 6500 Watt genereator. new ten gallon hot water tank. built in dishwasher. hideaway bed(couch). queen sized bed. sleeps four. kitchen table with 4 chairs. full sized shower with skylight. Vanity with sink. back up camera. near new Michelin tires with brand new spare tire. Good Sam Rand McNally GPS. Full set window awnings and a 14 foot awning. ONLY 71,000 ON A DIESEL PUSHER. ready to accept offers. reply by e-mail or text message. Serviced and ready to travel. Everything works or i'll fix it. Please call 604-218-3050 to view.